Published in the South Kent Gazette, 5 December, 1979. York Street, in the early part of the 19th century was a very respectable suburb, noted, among other things, for its scholastic establishments. For many years there were two inns in this street — the "New Inn," established about 1830 and the "Marquis of Anglesea." The latter was closed as redundant in 1929. It was named after the Earl of Uxbridge who was created Marquis of Anglesea, in acknowledgement of his having bravely led the Belgian Horse, and lost a leg in the Battle of Waterloo. It dated from about 1847. Until 1846, the corner at the bottom of Bowling Green Hill, and the land in the rear, up to Union Row, was occupied by the residence and gardens of Mr Sydney Spencer Smith Welch, and sold under the will of a Mr John Knocker. Immediately after the sale of that property, the "Marquis of Anglesea" was built, and York Terrace adjoining rebuilt. The houses on the same side, below the Terrace, except those flush with the street at the Military Road end, were all built about the same period. There was a York Terrace earlier. In directions for the polling in the election of 1837 mention is made of York Street, York Terrace, York Place and Black Ditch, all at that time being part of this same thoroughfare. Black Ditch was then existing in the central part of the street. The Dover Almshouses, which occupied a considerable area of the upper end of the street until recent years — their modern counterpart is the Battle of Britain Homes development, which overlooks the new York Street dual carriageway — represented a very old Dover Charity, which immediately after the suppression of the Maison Dieu at the Reformation supplied the relief to wayfarers, soldiers and sailors, which the suppressed religious houses had dispensed. The Almshouse was first off Bench Street, but at the Reformation it was transferred by exchange of premises to Queen Street, at the corner of Market Lane, long known as the Seaman's Hospital, and later there were four Almshouses erected in York Street. This Charity, which during the 16th, 17th and 18th centuries was aided by liberal bequests, was controlled by the Corporation of Dover, until the passing of the Municipal Corporations Act of 1835, after which, it was transferred to the Dover Almshouse Trust. The Corporation in 1607 borrowed £50 of the Almshouse money, on which they continued to pay five per cent up to the year 1755, when they reduced the rate to four per cent. In 1758 they borrowed £100 more, on which they also paid four per cent, and were continuing to pay that interest when the affairs were investigated by the Court of Chancery in 1818, the actual amount of interest which the Corporation at that time had paid for the £150 was £760, without reducing the amount of the loan. When the principal was paid off, a few years later, the Almshouse Fund was credited with nearly £1,000 from this transaction. The reference of the matter to the Court of Chancery arose from mistrust. It was considered that the Almshouse money was not being properly used, and St Mary’s parish having a few years before been at the expense of building a Poor House at Catherine’s Place, Charlton, the Overseers thought that they were entitled to the surplus of the Almshouse money to meet their expenditure. In the year 1800 St Mary’s Vestry asked the Corporation for permission to inspect the Almshouse Accounts, which was granted in 1803. The inspection strengthened the desire of the Overseers to secure a share of the fund, but their efforts for the 15 years proving unavailing, they, in 1818, applied to the Court of Chancery, and after a delay of two years, the Lord Chancellor, in 1820, ordered the Corporation to spend the accumulated fund in building additional almshouses, which were to be led to aged men and women of the parishes of St Mary, St James, Charlton and Hougham, at a nominal rent of £1 per year, and that thereafter the accumulations should be spent in building more almshouses or in relieving the casual poor. The Corporation preferred to handle the Almshouse money themselves rather than let it go to the casual poor, so they made arrangements to build on a large plot of ground on the side of Bowling Green Lane, behind the four existing almshouses. The history of the building was briefly recorded on stones inserted in three different places in the York Street almshouses. In the face of the wall on the right of the entrance from York Street was a memorial which recorded that the foundation stone was laid in 1823 by John Jeken, Mayor and Master of the Almhouses, and Edward Rutley and Edward Powell, almshouse wardens. It seems that 20 houses in all, were built at that time, arranged in a square; and in the face of the wall at the upper side of the square there was another stone bearing, amongst others, the name of Joseph Webb Pilcher, Mayor, and Master of the Charity, stating that the almhouses were opened in 1824. In the course of the building, it became necessary to remove one of the four old houses, but three remained for a good many years after. In his will the Dover businessman earlier referred to, Mr G. C. Rubie, made a bequest to the almshouse funds which included land in Ladywell subsequently bought by the town as a site for the fire station and electricity showrooms. The almshouses were controlled by the mayor and two wardens, appointed by the Corporation, until the Municipal Corporations Act of 1835, when the affairs were transferred to the Almshouse Trust appointed by the Lord Chancellor. The small rents of the almshouses, and income from its invested property, continued to accumulate, and, as stated on another stone, the funds accumulated after 1835 were used in 1841, by the trustees, to erect eleven more houses, which stood back on the southern side of the square. Later, the remaining three old houses gave place to a new block containing four, bringing the total number of houses up to 35; and on a vacant plot at the south-west corner of the square, there was added a little chapel, where services were held on Thursday afternoons. As several of the houses had two residents, the total number of inmates was over fifty. A reconstruction in 1908 provided separate access to each residence. Vacancies in the almshouses were filled by nominations in the proportion of half from St Mary's, a quarter from St James’s, and one-eighth each from Charlton and Hougham. The Maison Dieu pictured in the early 1870s, with a corner of Maison Dieu House, now the public library, on the right. The picture was taken soon after construction of the tower, with small windows, on the left side of the Maison Dieu. 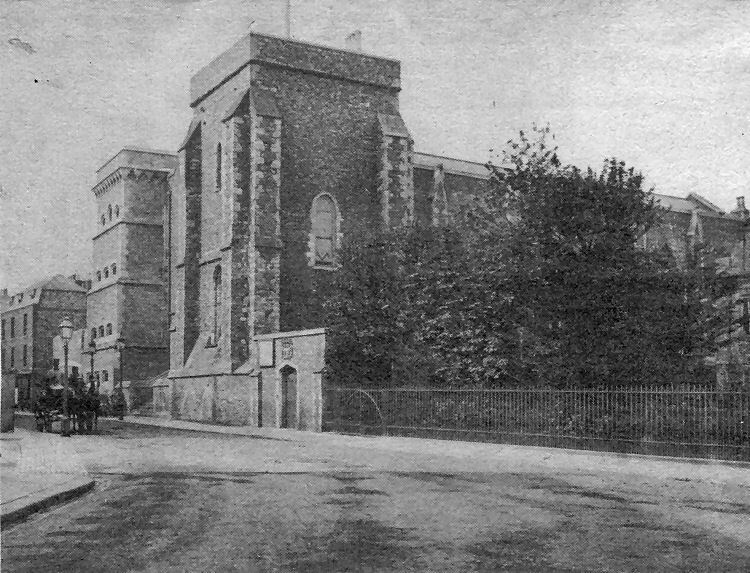 This was the old Borough Prison which was opened, along with the new council chamber at the rear of the Stone Hall, in 1868. The entrance to Ladywell was so narrow at this time it is barely perceptible in the picture. 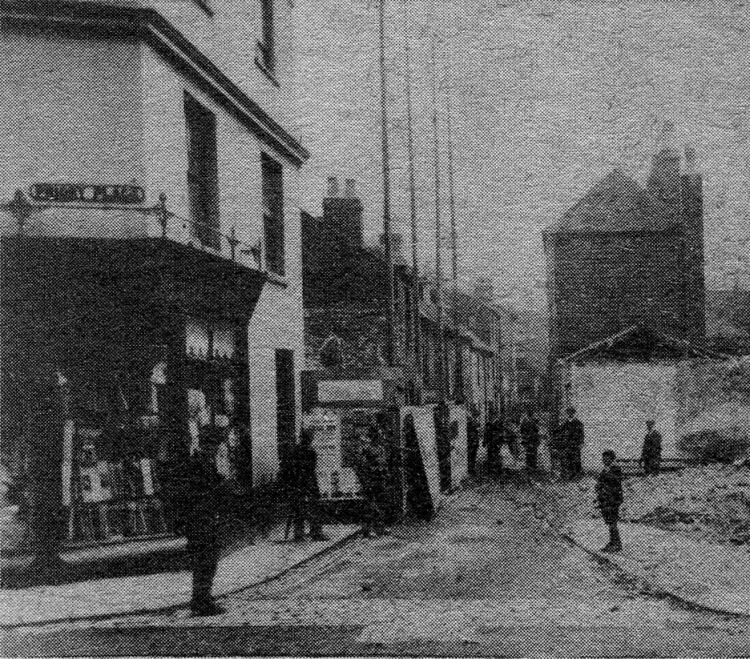 The picture, above, shows how narrow Worthington Lane was before the widening of 1894-95.